Clan Chief Donald MacLaren of MacLaren at Creag an Tuirc (the Boars Rock). The MacLarens farmed the Braes of Balquhidder, the country situated around Loch Voil and the small Loch Doine, since medieval times. So numerous and powerful were the MacLarens in former times that ‘no others durst go into church until the MacLarens had entered and taken their seats'. In the 18th century, the glen was much more densely populated than it is now. The farms that were situated near the Balquhidder kirk were named Lednascriden, Kirkton, Auchleskine and the three parts of Achtow. The distance from the western boundary of Lednascriden to the eastern boundary of Achtow was about three miles. A survey in 1755-56 found that 155 people, comprising some 54 families, lived on these farms. Stock consisted of 88 horses, 300 black cattle and 492 sheep. The main crops cultivated were flax and potatoes. The tenants included eight MacLarens, three Stewarts and one MacGregor. Rents were mainly paid in produce. raised, and more sheep were introduced to replace black cattle. The result was that fewer people were required to work the farms; one shepherd could now look after 600 sheep. The tenants' old way of life of cultivating the land with the plough and a few horses started to come to an end. Later, in other parts of Scotland , but not in Balquhidder, tenants were ‘cleared' from their small holdings by their landlords to make way for large scale sheep farming. This did not happen in Balquhidder as many of the farms were under administration. The government was faced with the problem of redundant farm workers, men displaced after the 1745-46 uprising, and in 1776 soldiers who had returned from the American War of Independence. It introduced cottage weaving of linen to provide some employment however, there was not enough work to go around the glens and people began to move away from their traditional homelands to seek opportunities elsewhere. Some families from Balquhidder settled on the Blair Drummond Moss, south of Doune, where they were given small farms rent free for seven years in return for helping to clear the moss. Others chose to emigrate, with their families, to North America where Scots settlers were in demand as they were well able to stand the tough North American winters. In 1820, James Stewart, who lived in the glen, mourned that in the parish of Balquhidder, where at one time lived between four and five hundred tenants, it now scarcely contains fifty. Because of these changes, the number of MacLarens living in the parish of Balquhidder steadily declined. In the 1840s, there were around 80 MacLarens in the parish, by the 1870s this number had reduced to 35. Today the MacLarens are not forgotten, they are well represented at the annual Lochearnhead Highland Games and visitors to the Balquhidder kirk ground will find that the ‘old kirk' is now owned and looked after by the clan. than "MacLabhraine" and in English "MacLaurin". Not only did Daniel erect the memorial in the kirk yard of Balquhidder, he also built a family vault in St. Mary's churchyard, Walthamstow ( London ) where he is buried alongside his brother Duncan . 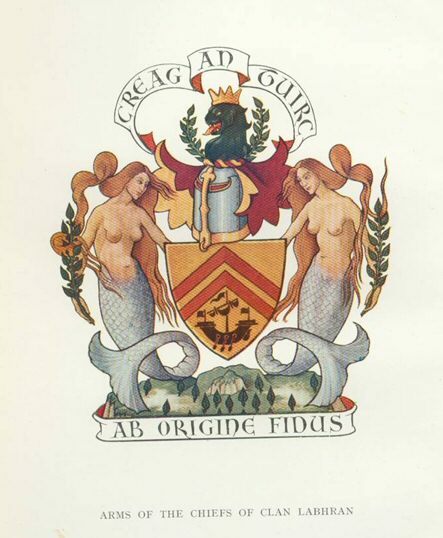 He wrote a book on the history of the clan and in 1866 was granted arms. He was a subscriber to McIan's The Clans of the Scottish Highlands (1845 and 1847). Who was Daniel MacLaurin, what prompted him to erect these monuments to the clan Labhran? Not much is known about Daniel's early life. He first appears in the records in 1829, when he was 40 years old, and was listed as an auditor's accountant in Lombard Street in the city of London . It is not known where Daniel trained to become an accountant. Daniel's brother, Duncan , was born in 1770 and was 18 years older than Daniel. Duncan and Daniel became business associates and shared offices in Lombard Street . Daniel's business prospered and he held shares in the Great Eastern Railway and was a shareholder in the London and Greenwich railway and the North British Railway company. Daniel did not marry and in his later years he lived with his niece, Mary Cox in fashionable St John s Wood only a stone's throw from Lords cricket ground. Daniel was in his 90 th year when he died. In his will, he left £2,000 to the University of Edinburgh for the endowment of the MacLaurin Bursary. He instructed that the MacLaurin Bursary was to be restricted and to be "only for students of the founders name MacLaurin (or in Gaelic orthography MacLabhrin) tenable by each Bursar for the term of four years. It was to be in the patronage of the town council of Edinburgh and in case in any year or years the said Bursary be vacant the sum or sums that would have been paid for each year or years that it been filled shall be added to the capital of the Endowment". It is not sure how many McLaurins benefited from this bursary. Another mystery is that it is not known what prompted Daniel MacLaurin, possibly christened Daniel MacLaren, to stand up so forcibly for the old spelling of the clan name MacLaurin? Whatever the reason Daniel gave the clan its first real monument in the kirk yard at Balquhidder. Around the world the spelling of the clan name as MacLaurin is found and used in Australia, North America and is still used by descendants from Daniel's father who live in the UK. There is no evidence however, that it is the preferred spelling of the name and the spellings MacLaren and MacLaurin have equal validity. The inscription on the Balquhidder memorial is also a memorial to those women and children of the clan together with the aged clan chief who were killed by ‘bandits from Glen Dochart' in 1558. The home of the MacGregors was the eastern border of Argyll and the western border of Perthshire, including Glenorchy, Glenstrae, Glenlyon and Glengyle. In the 16 th century the MacGregors moved further east towards Balquhidder and were said to have owned lands at Edinample. The Campbells of Breadalbane however thwarted their territorial ambitions and took Edinample from them. Not having any farms the MacGregors turned to cattle raiding and plundering their neighbours lands. There were a number of well-described incidents of the Macgregors attacking the MacLarens, and other clans, who were living in around the glen in the 16 th century. In 1542 a band of MacGregors, set out from an island in Loch Rannoch, stormed into Balquhidder during Passion Week, and killed 27 MacLarens consisting of men, women and children ( Duncan MacGregor's poem published in the Black Book of Taymouth in 1855 documents this event). Again, a similar raid occurred in 1558 when a party of MacGregors from over the hill in Glen Dochart swept into the MacLaren settlements at Edinchip killing 18 (this is the raid referred to by Daniel MacLaurin). Other clans had similar problems with the MacGregors. In 1558 some MacGregors were caught poaching deer in the royal forest of Glen Artney (south of Comrie) by John Drummond, the King's keeper. Instead of holding them for trial, Drummond cut of the ears of one of the MacGregors in order to teach him a lession. The next year Drummond was again in the forest where he came across the MacGregors, who were seeking retribution; they ambushed and murdered him. These MacGregors cut off Drummonds head and wrapt it in a plaid. On the way back to Balquhidder, they stopped at Ardvorlich and the laird's wife, Margaret Stewart who was married to John Drummond's brother, offered them hospitality. When she was out of the rooom the bloody head was upwrapped, set on a table with bread, and cheese in its mouth. The story continues that the shock caused Margaret to become insane and for some days, she wondered around the countryside until her husband found her and brought her home. Meanwhile the MacGregors continued their journey to Balquhidder with their gory prize. When they arrived, they presented the head to their chief. The story goes that the whole clan was assembled and each man laid his hands on the bloody head and avowed his approval for the deed, and swore to defend those who had participated in the crime. The reaction of the Crown was predictable and the MacGregor name banned from use. It was not until 1775 that the penal statutes against the MacGregors were finally repealed. The MacGregors remained in the area and during the time that their name was banned they took different names. Some were called Drummond and others Comrie after the village of the same name. As life stabilised in the glen some MacLarens took MacGregor brides and even Daniel MacLaren's mother, as we have seen above, was a MacGregor. Other people come to the Balquhidder kirk yard to see the grave of Robert (Rob Roy) MacGregor, the third son of Donald Glas (the Pale) MacGregor, who was born in Glengyle in 1671. Rob's colourful life story is well described elsewhere, however his unscrupulous behaviour and that of his sons was to have a lasting effect on the MacLarens living in the glen. This started with a land dispute over the farm Inverlochlarig Beg and ended with Rob fighting (and losing) a duel that took place at Kirkton in 1732. Rob died at Inverlochlarig Beg in 1734 but this was not the end of the matter. On 4 March 1736, a John McLaren was ploughing his lands at Drumlich (in the western part of the glen) when he was shot in the back by the 15-year-old Robert MacGregor, Rob's youngest son, known as Rob Og. The reason for the shooting was said to be that Rob Og was seeking revenge for a dispute over his mother's farm Inverlochlarig. In March 1736, five days after John McLaren of Drumlich was murdered, two of Rob Roy's sons threatened Donald McLaren on the adjoining farm of Invernenty and houghed (slashed) the legs of 27 of his cattle. James and Ranald, Rob Og's brothers, were quickly arrested but apparently not before they had burnt McLaren's house. Donald was a drover and nine years later became a Captain in the Appin regiment and wounded at the battle of Culloden. The trial of the MacGregors took place in August 1736. The MacGregor brothers were acquitted of complicity with Rob Og in the murder of John MacLaren. They did not escape the verdict of being reputed thieves, and they were ordered to find surety of £200 sterling for their good behaviour in future, remaining in custody until this was arranged. The MacGregors had acquired a reputation and at the trial ten men petitioned to be specifically included in the caution, to protect themselves, their lives and property from the MacGregors. These included Donald McLaren of Easter Invernenty, Alexander McLaren in Auchleskine, John McLaren in Braes of Leny, Dougald McLaren at Bridge of Turk, John , Robert and Malcolm, sons to the deceased Duncan McLaren in Wester Invernenty and Duncan McLaren, servant to Donald McLaren. Alexander McLaren in Auchleskine gave evidence at the trial of the MacGregor brothers. Ludovick McLaren is also listed as living at Auchleskine at this time, and it is it likely that Alexander and Ludovick shared the tenancy. Daniel's father John was the son of Ludovick MacLaren, sometimes written as Duncan MacLaren, of the farm Auchleskine. The MacGregors still exercised some influence in the glen. In 1755, Rob Og's older brother Ranald McGregor shared the tenancy of the farm Kirkton with Duncan Stewart and Robert MacLaren. Ranald wanted more land and in 1760 petitioned for his lease to cover the whole of the farm. In his petition, he noted that Robert MacLaren ‘was a poor man and would willingly give up his land if otherwise provided for'. Ranald got his way, but he may have been less than happy if he had known that the McLarens returned to Kirkton in the early 1800s when Duncan and Margaret McLaren were the tenants. This is the background to some of the events that would have influenced the young Daniel MacLaurin. In his book Daniel says that ‘the banks and braes of my native Balquhidder are always lovely to my sight in my seventy-ninth summer; and happy I am to behold the modern improvements, and the dwellings erected for the use and comfort of the very few remaining inhabitants, the tenants of Mr Carnegie of Stronvar House'. Today the hill slopes are still dotted with sheep; the braes are at peace with the world, and clan wars almost forgotten. There is still a MacLaren family living in the glen, as Donald MacLaren of MacLaren the clan chief, lives at Kirkton and MacGregors still live in the district. More details about MacLarens living in Balquhidder and Strathearn are given in Creag an Turic, a book on the social history of members of the Clan Labhran (MacLarens and MacLarens) by Neil McLaurin . The book is available in the MacLaren tent at the BLS Highland Games in Lochearnhead and from the Clan MacLaren Society. Creag an Tuirc means the Boar's Rock and is the war cry of the clan Labhran.